Is counseling for the professional only? What do you do when a member of your small group or someone at work asks for advice? Where do you begin? Be an effective people helper. 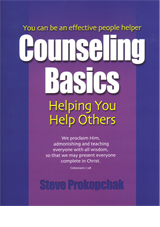 Written by Steve Prokopchak, a professional counselor who has over 15 years of experience in cell group leadership.